The National Museum of Scotland teamed up with writers’ organisation 26 to celebrate some of its greatest treasures – from the Lewis Chessmen to the Darien chest. They then paired writers with objects and asked us to write precisely 62 words about that treasure. I’d been hoping to be twinned with the Queen Mary harp, which is in the museum’s permanent collection. Instead I got this terrifying mask that used to belong to the 17th century Covenanting minister, Alexander Peden. He used the mask to disguise himself as he was giving illegal sermons on hillsides in Scotland during the ‘Killing Times’. Made of vellum, the mask has wooden peg teeth and seems to have feathers stitched around the eyes. To write my poem, I imagined what the mask would say to museum visitors today, if it could speak. The poem was displayed in the museum alongside the mask for a special exhibition celebrating the treasures. The mask still gives me chills. Peden was one of the ministers who signed the 1638 National Covenant that opposed interference in the Scottish church by the Stuart monarchy. He was on the run from government forces for 11 years and preached at illegal ‘conventicle’ meetings on hillsides to thousands of believers. By 1670, preaching at conventicles was punishable by death. Peden would have worn this wig and mask in the hope of evading government forces. Read ‘The Fanatic’ by James Robertson for a fascinating insight into the Covenanting ministers who lived and died during the ‘Killing Times’, when up to 18,000 people were brutally put to death. Despite being sent to the Bass Rock, the Scottish Alcatraz, Peden avoided the hangman’s rope and died a natural death aged 60. But he seems to be a footnote among Covenanting ministers, and further details of his life evade capture. There’s a chapter on Peden in ‘Scots Worthies’ by John Howie (which discredits talk of his prophecies), and you can see his bible in Greyfriars Kirk – open, appropriately enough, at the Book of Job. 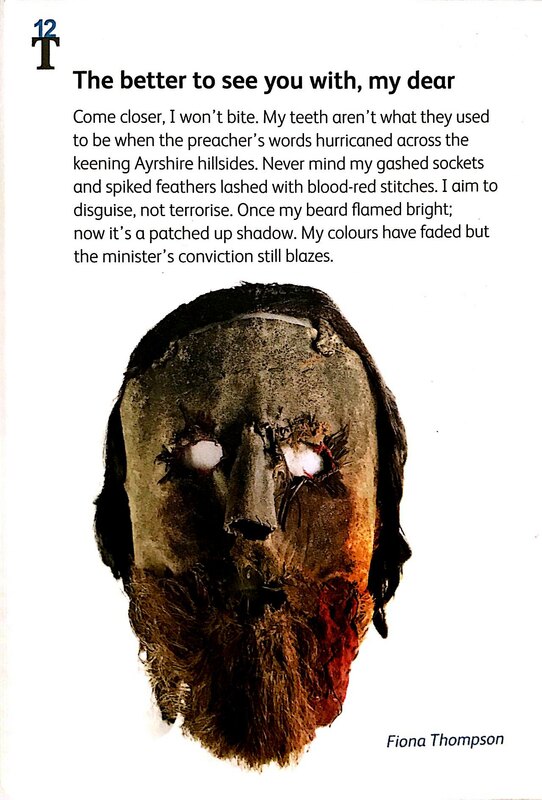 I’d presumed that all Covenanting ministers would have worn masks. But curator George Dalgleish says that this is the only surviving example, and that there is no documented evidence that it was a common practice for Covenanters to disguise themselves this way. And the closer you look at the mask, the stranger it becomes. How would you make your sermon heard through that tiny mouth crowded with wooden teeth? Why are there feathers stitched around the eyes? Isn’t that a strangely theatrical decoration for a Presbyterian minister? And why are there spots of what look like greasepaint on the cheeks? Was this originally a theatrical mask, adapted for a different type of stage and performance? We’ll probably never know. See the wig and mask for yourself at the National Museum of Scotland – Kingdom of the Scots, Level 1. Follow this link for more thoughts on how to use poetry in your copywriting.